After about a year, MSC also rented the back part of the property which was previously used by DOST as garage for their vehicles and quarters for its employees. Even after occupying the 4th floor of the La Suerte building, the growing number of students in both the high school and tech-voc departments necessitated the acquisition of more space. 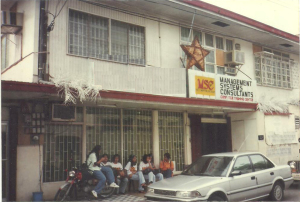 During that time the MSC Annex was the most spacious site. The back area allowed for two more classrooms, a canteen, a small hall, music room, an office and a garage. This entry was posted in History, MSC and tagged A. Fule St., agrix, bunquin, dost, MSC Annex on November 28, 2014 by Jose Adonis Duma.